and the short row heel is proportioned larger. creating a “Z” shape on the inside of the fabric. Cut end flush with surface. [*Yarn-over in reverse, K1, pull YO over K1 and off the needle*, repeat from * to *, then pull 2nd stitch over first stitch and off the needle]. Repeat from [ to ] around. 4+4, 4+4, 4+4, 8+ 8, (8+8, 8+8, 8+8, 8+8) stitches . remembering you have started with one stitch already on the back needle. »Turn both needles to face the right, with the former front needle becoming the back one. »Set up round: slide the front point out past the stitches on it (moving the stitches onto the cable part of the needle) to have 12”of needle/cable to work with. Position tail yarn behind yarn from ball. With the right point, knit across the stitches of the back point, then turn your work 180*. Slide the stitches on the cable onto the new back needle point, and slide the front needle point out past the stitches on it to have 12” of needle/cable to work with, and knit across the stitches of the back needle, observing that they are reverse mounted on the needle, and you will need to work into the right half of the stitch which presents itself around the back of the needle THIS TIME PAST ONLY. Turn your work 180*. Place BOR (Beginning Of Round) marker. *Slide the stitches on the cable onto the new back needle point, and slide the front needle point out past the stitches on it to have 12” of needle/cable to work with, and knit across the stitches of the back needle. Turn your work 180*. first round: work 1 stitch Tuffy, work 1 stitch Lush each round thereafter: work Tuffy on Lush color, and Lush on Tuffy as presented. the BACK needle point is pulled out 12” and the stitches are worked across the FRONT needle. Knitting will continue in this manner for the rest of the sock. Work toe as noted, increasing to 12, 14, 16, 18 (20, 22, 24, 26) stitches on each needle point, or 24, 28, 32, 36 (40, 44, 48, 52) stitches total around. 1 ½, 2, 2 ½, 2 ½ (2 ¾, 2 ¾, 3 ¼, 3 ¼)” from cast on round. 4, 4 ¼, 5, 6 ½, (7 ¾, 8 ¾, 8 ¾, 9 ¾)” or 1 ½, 2, 2 ½, 2 ½ (2 ¾, 2 ¾, 3 ¼, 3 ¼)” before desired foot length, ending after a chart row 2.  Connect LUSH “floats” after no more than 2 stitches to keep them flatter within the sock. SHORT ROW HEEL: Move BOR marker back 2 stitches. Counting from this point, place a clip for LM after stitch 12, 16, 20, 20 (24, 24, 28, 28) to mark heel stitches. You will be making the heel working back and forth using short rows in Seeded Color Pattern (as for toe). All short row wraps are worked with BOTH yarns. Row 1: Increase 2 stitches at the beginning and 2 stitches at the end IN PATTERN with INC R: total on heel needle after first row: 16, 20, 24, 24 (28, 28, 32, 32) stitches. K across to before last stitch before LM, SRW the last stitch and turn to work back. Row 2: P across to before last stitch before BOR marker, SRW the last stitch and turn to work back. Row 3: K across to 2 stitches before LM, SRW the next stitch and turn to work back. Row 4: P across to 2 stitches before BOR marker, SRW the next stitch and turn to work back. and 6, 6, 8, 8 (10, 10, 12, 12) stitches left unwrapped at the center of the heel stitches. Make sure the last row worked is a P row. Place a HM (heel marker) on the next stitch and continue knitting to the end of the heel stitches, working across the stitches that have wraps on them, until you arrive at the LM. NOTE: pick up the wrap along with the stitch it is on and knit through both together. 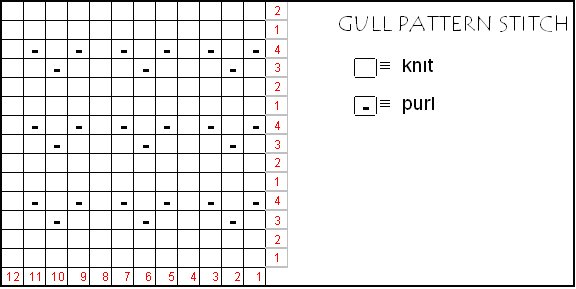 Knit across the (previously left resting) foot instep stitches in GULL PATTERN STITCH until you arrive at the BOR marker. Round 2: Knit all 28, 32, 36, 40 (44, 48, 52, 56) stitches in pattern around and back to before HM. Row 1: P 6, 6, 8, 8 (10, 10, 12, 12) (center heel) stitches, SRW, turn (TN). Row 2: K 7, 7, 9, 9 (11, 11, 13, 13) stitches, SRW, TN. Row 3: P 8, 8, 10, 10 (12, 12, 14, 14) stitches, SRW, TN. Row 4: K 9, 9, 11, 11 (13, 13, 15, 15) stitches, SRW, TN. P 14, 18, 22, 22 (26, 26, 30, 30), SRW, turn, has been completed. You are now at the BOR marker. 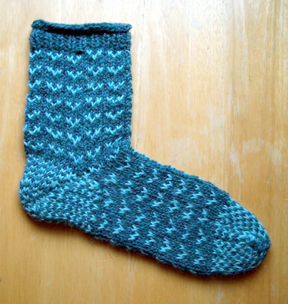 LEG: Knit evenly around in GULL PATTERN STITCH until sock measures 4, 5, 6, 7 (9, 10, 11, 12)” from bottom of heel, ending after a Round 3 or 4. Break off LUSH yarn. Reducing 4 stitches evenly on first round, work 4 rounds *K1, P1* rib, followed by 2 rounds knit. Bind off with JENY’S BIND OFF.